We have already looked at smartphones majoring on particular qualities of screen size, new form factors, and cameras at the MWC 2019. Another popular request from smartphone enthusiasts is for a bigger battery, and it is safe to say Energizer has you covered in this respect with its new Power Max P18K Pop. 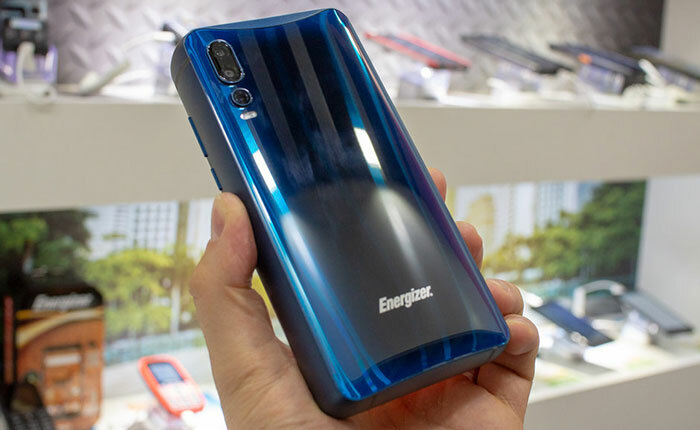 This is just one of 26 new smartphones and feature phones Energizer is showing off at MWC. The other new models include a 5G 10,000mAh foldable prototype. According to Energizer's promotional literature, the new P18K Pop can be used to make up to 90 hours of calls, listen to 100 hours of music, or watch 2 days of video on a single charge. Standby time is quoted as being 50 days. Fully recharging via the supplied 18W adaptor takes 9hrs. Having such a big battery is a great asset, especially as it can be used to charge other devices you might own. However it will impart a substantial weight and thickness to the device. In the promo PDF I received there were no side-angled shots, but taking to Twitter there were plenty of examples. Smartphone news site Phone Arena took some good shots of the P18K Pop at the Energizer stand. Above you can see a nice comparison between the LG V40 (left) vs the Energizer Power Max P18K Pop. Though that site got some hands-on time with the device, we don't see any actual dimensions or weight mentioned; only that it "barely fits in a normal pocket… and weighs a ton". GSM Arena estimates the device thickness at between 30 and 40mm. Looking at other phone features, some will be pleased that Energizer avoided a notch or screen cut-out by utilising a popup-selfie camera. However, despite its chunky body I see that there is still a slight camera bump on the rear, and there was no room for a 3.5mm headphone jack. German audio, turn on auto-translated English captions if you need. Estimated price is 600 Euros. Release is expected in June 2019. 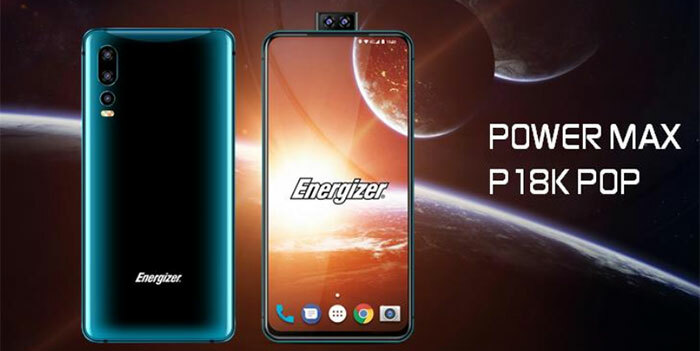 Last year Energizer teased its Power Max P16K Pro at MWC. You can use it as a power bank? To charge what?! I wonder how many they will actually make. They made the news previously with the P16K and had a bunch of retailers listed on some promotional material but I didn't see actual customers reviews, videos or posts. I wonder if they actually put it into production. I'll regard this phone as vaporware till it hits shelves. It'll smash right through any shelved it hits!